Maria Safariants graduated from the Leningrad Conservatoire. As a soloist and chamber music player, having studied with the brilliant tutor Maria Karandashova. Upon graduation she studied with the famous Boris Gutnikov at his post-graduate course in St.Ptersburg. 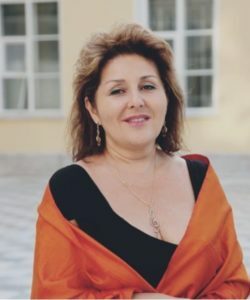 Since her student years, she has maintained an intensive concert schedule, making appearances as a soloist with various ensembles in Russia, CIS and abroad. Her 1991 tour to Spain, where she performed Vivaldi‘s “Four seasons” (Le Quattro Stagioni) with the St.Petersburg “Hermitage” orchestra, was an immense success and resulted in contract to work as concertmaster with the Orchestra Internazionale d‘Italia. At the same time she continued to arrange her solo performances. Maria Safariants has also been a quest at numerous international chamber music festivals in Russia, Austria, Italy, Germany and Spain.